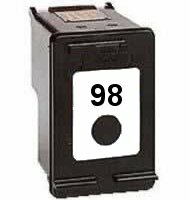 Remanufactured HP 98 C9364WN Black Inkjet Cartridge. Yield: 400 pages. The use of compatible supplies does not void your printer warranty. Remanufactured HP 98 C9364WN Black Inkjet Cartridge. Yield: 400 pages.